DANA POINT, Calif., May 30, 2012 /PRNewswire via MarketWatch/ -- SimpleSignal, Inc., a cloud-based Unified Communications and Collaboration provider for business, today announced it has launched a mobile video communications and conferencing application that works seamlessly across a variety of mobile, desktop and telepresence/video-enabled devices, via a WiFi connection or a 3G/4G network. SimpleSignal customers already enjoy anywhere, anytime connectivity, but this new application adds enterprise video communication to every mobile end point in the enterprise. The seamless integration of iOS and Android operating systems into SimpleSignal's Unified Communications platform, coupled with the mobile video capabilities of these devices, means that advanced enterprise communications capabilities are no longer confined to the desktop. "This new mobile video service is the biggest breakthrough in SimpleSignal history," said Dave Gilbert, CEO of SimpleSignal. "It's revolutionary to experience video conferencing with our customers connecting over their own mobile devices, as well as a variety of desktop and teleconferencing video equipment including Polycom, Tandberg, Cisco, InFocus, LifeSize and more." "This is a killer app for the way businesses are being built in today's economy. No longer is business about a specific location," continued Gilbert. "Companies are being built virtually with no limitations on geographic location. It's now really more about unifying your network. Adding iPads, iPhones and Android devices through this new mobile video application is the final piece in the puzzle to doing just that." SimpleSignal is a cloud-based Unified Communications and collaboration service provider to U.S. and International business customers. SimpleSignal has created the most flexible business communication solution in the industry by enabling the use of any combination of mobile device, desk phone, or video equipment regardless of manufacturer. SimpleSignal has offices in Denver, CO, and Dana Point, CA. Find us on the web at http://www.simplesignal.com . For sales, call 866-434-4404. Read our blog: http://www.simplesignal.com/blog . This press release was issued through eReleases� Press Release Distribution. For more information, visit http://www.ereleases.com . \"This new mobile video service is the biggest breakthrough in SimpleSignal history,\" said Dave Gilbert, CEO of SimpleSignal. 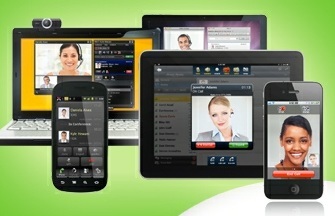 \"It's revolutionary to experience video conferencing with our customers connecting over their own mobile devices, as well as a variety of desktop and teleconferencing video equipment including Polycom, Tandberg, Cisco, InFocus, LifeSize and more.\"
\"This is a killer app for the way businesses are being built in today's economy. No longer is business about a specific location,\" continued Gilbert. \"Companies are being built virtually with no limitations on geographic location. It's now really more about unifying your network. Adding iPads, iPhones and Android devices through this new mobile video application is the final piece in the puzzle to doing just that.\"